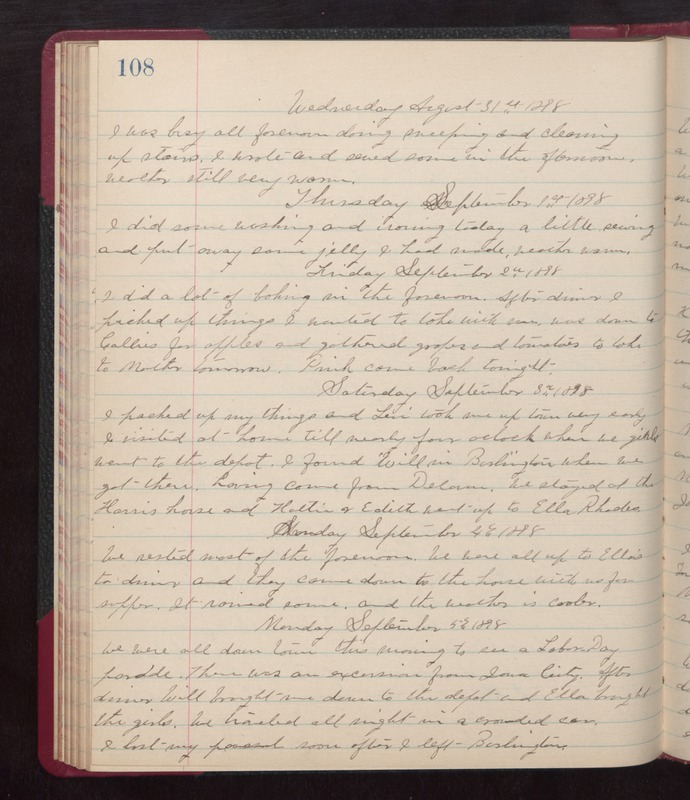 Wednesday August 31st 1898 I was busy all forenoon doing sweeping and cleaning up stairs. I wrote and sewed some in the afternoon. weather still very warm. Thursday September 1st 1898 I did some washing and ironing today. A little sewing and put away some jelly I had made. weather warm. Friday September 2nd 1898 I did a lot of baking in the forenoon. After dinner I picked up things I wanted to take with me, was down to Callies for apples and gathered grapes and tomatoes to take to Mother tomorrow. Pink came back tonight. Saturday September 3rd 1898 I packed up my things and Levi took me up town very early. I visited at home till nearly four oclock when we girls went to the depot. I found Will in Burlington when we got there having come from Delavan. We stayed at the Harris house and Hattie & Edith went up to Ella Rhodes. Sunday September 4th 1898 We rested most of the forenoon. We were all up to Ellas to dinner and they come down to the house with us for supper. It rained some and the weather is cooler. Monday September 5th 1898 We were all down town this morning to see a Labor Day parade. There was an excursion from Iowa City. After dinner Will brought me down to the depot and Ella brought the girls. We traveled all night in a crowded car. I lost my [present?] soon after I left Burlington.